Teo Azkuharaz and his fellow archeologists expected to be answering scholarly questions in the ruins on the planet the team is bound for. But the questions become those of life and death when their ship is attacked and taken prisoner by the yfel, a brutal reptilian race defeated millennia ago by the Virinian empire. Now the yfel are returning to exact revenge…refusing to believe their enemy no longer exists. 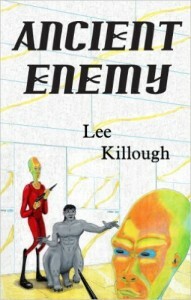 As a linquist, Teo becomes responsible for speaking with the yfel, but is given a slow acting poison, with the antidote promised only in return for information that will allow them to destroy the Virinians and their subject worlds, and also finds himself a pawn in deadly plots and schemes among the yfel themselves. Can he find a way to save his ship’s crew, his fellow archeolgists, and the planets the yfel want to destroy before he dies?